This will probably be our last puppy. Peat’s not all bad. He’s a puppy, doing puppy things. He’s got limitless energy and limitless appetite for biting everything and everyone. He can shriek for 20 minutes straight at any time of day. He has pushed Angus to the brink of speaking English to express his frustration; the look in Angus’ eyes after Peat mauls him for a solid half-hour is unmistakably desperate. He’s 13 weeks old today, and continues to piss on the floor whenever he fancies. Peat does show moments of calm affection, and has actually begun sleeping on the bed with us through the night. And he is a pleasure to look at regardless of his behavior. But the puppy and his puppiness is wearing us out and has propelled our stress levels through the roof. All this probably bodes well. At least I have to tell myself that. He’s interested in birds, and points the wing, as well as fetches anything I throw, leaning into me upon arrival. He’s quick, fast, and seems to have a super sensitive nose. I think he’ll be ready to look for birds in September. Wanting a puppy to grow up just seems wrong. It’s the cutest time of their lives. When they’re sweet there’s nothing like it. After he’s calmed down enough to go to bed with us, he nestles in my armpit and lets me stroke the downy fur on his head. My Brittany pup is 21 months old now. Finally knows what no biting means. She is solid on point, shot and waits for the command to fetch. She is solid on a covey rise. Unfortunately I have to raising my own Chukars to hunt. I will release them onto the desert in front of my house and see if they recall to the pen. Oh yea, Flat desert. Wow, John. You are a patient, admirable man. Where do you get your chukar eggs? The trainer I work with does the incubating and first brooder. I get them into my flight pens at 3 weeks old. Never asked where he gets eggs. Very cool. I’d like to try raising chukar here… I grew quail in high school, but that was just to augment the neighborhood cats’ diets. If you leave some in the pen. They will recall the birds you have released. Pen needs some recall entrance cones along the bottom. Congratulations on the new pup. It is good to hear from you. I am happy to know there is someone besides me thinking about next hunting season. You are working with a pup and I am making decoys. You might think about this the next time you are looking for a pup. Most of my friends have said they wanted a pup (8 weeks) because ……………………….. and because they wanted the pick of the litter. Or they think the only way to deal with a hunting dog is to have it from the start and do all the training them self. What they don’t know is that breeders like Marla often keep one or more of the best pups out of the selection pool because they want them for their own breeding program. After some time these pups get culled out because of one reason or another. Some get culled simply because they do not show well. They are great dogs they just don’t like to be in a show ring and for strangers to their hands where they are not suppose to be. There are lots of reasons why a dog may not prove to be worth keeping for breeding purposes. This process can take up to a year and possibly more. It takes two years for a dog to qualify for being exrayed for bone structure. There is no way to be able to identify the personality of a pup in just 8 weeks. Picking a good pup with the right personality traits is as much luck as it is skill. Basic bone structure, body lines and bulk can be somewhat identified. Good hunters take time to identify. Waiting gives a person like you the opportunity to pick up a high quality dog who is trained (at least in obedience), has been fed the best food, has learned to be sociable with other dogs and has a known background. When someone is lucky enough to get one of these dogs from Marla they write back weekly telling her how much the dog fits right into their family. They send her pictures of the dogs sleeping in bed with the kids, riding in a boat or retrieving something from a pond. One girl sent Marla a video of her dog diving to the bottom of a pool to make a retrieve. A good breeder like Marla produces a one year old that is any ones dream dog. By the time Marla is ready to let a pup go she knows it well and can tell the person if the dog is going to hunt or not. I have a hunting partner who got a new pup and by the time he found the dog would not hunt it was too late. He was attached and would not let the dog go. We hauled that dog around for 12 years. It could not find a goose if it was in the driveway. The 3 year old lab he has now retrieves geese, but will not pick up a duck. No exceptions. Three times my brother bought a new pup and raised it to about 10 or 11 months old before his wife said “Pick me or the dog. You will not keep both.” He finally got an older lab and all went well after that. He loved that dog and it proved to be a great hunter, specially on pheasant. For now this might help. Buy one of the heavy collapsible wire pens that can be kept in the house or placed outside. Give Peat more than enough things to chew on in the cage. Only let the pup out of the cage in the house when you have time to give the dog your full attention. Don’t give it any opportunity to chew on good things. Don’t make Angus be the baby sitter. You might wind up with two dogs giving you trouble. It will be to your advantage to have Angus as the teacher once you are in the field, but at home this may not be the best strategy. For now try to keep the pup close enough so it can be corrected when it starts to yap. The longer this goes on the harder it will be to get it to stop. When you leave both dogs at home keep them separated with the cage. They can be next to each other, but not together. I hunted with an older dog once that I thought I would shoot before the day ended. It never did get tired of yapping and barking. That was a last trip with that guy. Like you say, Peat needs to have time to be a puppy. But the behavior needs to develop/be modified along with his growth. Some pups are more difficult than others. In the end the effort is well worth the time spent. Good luck. Thanks for your thoughts, Dale. Tell Marla to let me know when she starts breeding Brittanys. I’ll put a deposit down now on a 1-year-old! I was glad to see that I’ve done some things right – we have a crate like you mentioned where Peat spends most of his days, but I’ve been relying a little too much on Angus to babysit and will end that now. He’s got numerous things to chew on in and out of his crate, and so far we’ve been able to keep him from ruining anything we don’t want him to (although I’m waiting…). The yapping, though, is tough to correct. I’ve read a bunch and it doesn’t work with him yet. I’ll keep trying, obviously, because I can’t stand it. We’re working on sit-stay and come, and it’s going okay. I’m going to try whoa but in the past didn’t do such a good job at it. We do get out several times a week in the field and he looks good and follows Angus to a limit, then comes back. I’m glad I have the summer to do this. Last puppy? You guys are just kids. I don’t think this is my last pup and I am 73. Been there, Carole! Leslie nearly strangled him a few nights ago, and then felt so bad she broke down in tears. Yes, Chris, Peat’s from Sunburst. So is Angus. He’s got a young American roan sire who impressed us. I hope Peat’ll follow in his dad’s footsteps. Our French Brittany puppy was one year old on the 2nd and the experience with this one is quite similar to yours, a major hand full. I had short-lived thoughts of gunny sacks, rocks and deep lakes interspersed with long periods of joy with Anouk. Her father is 10 and although that is some time back I do not remember him being so demanding. By 3 months she was consistently ringing a bell at the door to go out but it was on a 2-3 hour schedule and that lasted until she was nearly 9 months old. Lots of messes because the time between the ring and the need to be out was short. Fortunately I am retired as she would be permanently living in someone else’s home had I been on a work schedule. Her dam’s owners took care of her while I was in central Washington hunting chukar with my son in October and they were ecstatic to hand her back to me when I returned. She accompanied us on hunting trips last fall in September and October which were typically 5-6 miles long. The ptarmigan hunts were in the mountains up 1,500 feet. She is tough and inquisitive, refused to ride in my vest and explored away from me. It was cold by then and her short puppy hair was inadequate for the exposure. We did our first overnight scouting trip into a valley on the Kenai Peninsula this week and I see what I think is going to be an excellent bird dog in her. I plan to return to Washington this fall and take her with us to hunt with my son. I have enjoyed your blog and found it looking for chukar hunting advice. My older dog and I guided ptarmigan hunters for a lodge on the Alaska Peninsula for five years and have hunted pheasant in Nebraska, South Dakota and North Dakota and grouse up here but last year was our first exposure to chukar country. Quite demanding it is. Dennis, thanks for your great story. I really enjoyed reading about your pup (Anouk?). Ptarmigan hunting must be amazing – never done that. 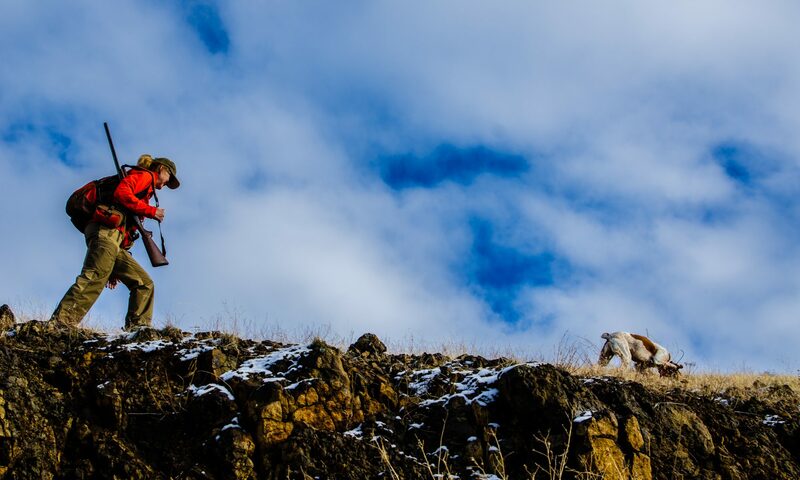 Where in Central Washington did you hunt chukar, and how were the bird counts? I’m glad to hear you see her becoming a great bird dog. Peat will get there if I can muster the patience and discipline to work with him. This is my third Brittany, and by far the hardest-headed. Thanks again for your comment. Stay in touch! Feel free to send email to my address. He does look like a hellion though. My wife & I enjoy the photos of him. Getting a pup is the only way to go in my experience. I’ve had dogs started/ trained for me and it always seems they have issues. Puppies learn behaviors from who there with at those critical bonding times. Besides you’ll love him the more for going through the good & hard times. Achieving a dog like Angus requires the whole experience. From puppy, through adult, to death its worth every moment of a dogs short life to be there. Thanks for the comments, Gabe. I’ve been meaning to write a follow-up to this post because Peat’s won us over and grown (not just physically). I like what you reminded me of, about the whole experience. Yes! I am putting the finishing touches on my 23 month old Brittany. She will stand in the middle of a covey as it rises 1 to 2 birds at a time and not move a muscle. She moves slowly on running coveys, never putting enough pressure to cause them to fly. When in heavy cover and she smells birds she seeks me out before pointing the birds. She knows she needs me to get the bird. Love training my own dog. Such a joy. Tools used: Remote control pop up dog and several e-release bird traps. Lots of bob whites. first I trained her the rick smith whoa post method. Moved from flank lead to e-collar on flank to say whoa. As the dog nears the e-trap with 2 to3 quail in it, before she scents them, pop them up with a very light stem on the flank e-collar at the same time. She learns to stop and watch on covey rise. With pop up dog. As she nears the dog up wind , pop it up and at the same time release some bobs from a trap in front of the pop up dog. She will back the pop up who is on point. Go to the pop up and say whoa give hand signals whoa. Real dog is staunch and watching. Now kick around the brush in front of pop up. Release another 2 or 3 quail that are in another e-trap. Have a shooter shoot a bird while you have eye contact with dog and hand signal for whoa. Finger on button for flank stem. Whoa. when bird drops give command to fetch. Dog will be solid to shot and drop. Of coarse a seasoned dog will start retrieve on shot without command to fetch the first time one of them chuckars out run her/him. But she will hold till shot which is much safer and she marks the bird better holding till fall. Well I could tell you about my Brittanys and similar trials I went through and that others have already noted. First as you know he’ll grow up and out of most of this (as did we). But I’ll note that if 1940’s Hollywood casting was looking for a devil may care Irish rouge they would pick Peat, and if they were really creative they would have named him “Peat” after the whisky he drank the the place he escaped to. Good luck and thanks for the blog.